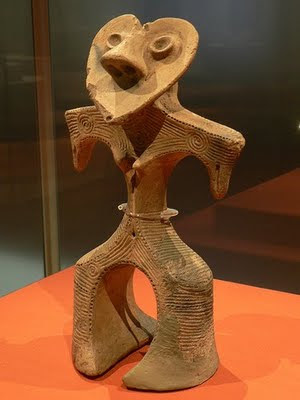 are small humanoid and animal figurines made during the late Jōmon period (14,000 BC to 400 BC) of prehistoric Japan. Most of the humanoid figurines have the breasts, small waists, and wide hips of females and are considered by many to be representative of goddesses. Many have the large stomachs associated with pregnancy, suggesting that the Jomon considered them Mother Goddesses. According to the Metropolitan Museum of Art, these figurines "suggest an association with fertility and shamanistic rites". Made from clay, these figurines were never realistic, but, rather, were fashioned into fascinating shapes. The Dogū tend to have large faces, small arms and hands and compact bodies. Some appear to wear goggles or have 'heart-shaped' faces. Most have marks on the face, chest and shoulders, which suggest tattooing and probable incision with bamboo. Dogū come entirely from the Jōmon period and do not continue to the Yayoi period. As for Jōmon pottery, Dogū has various styles by exhumation area and generation. According to the National Museum of Japanese History, the total number found throughout Japan is approximately 15,000. Most of the Dogū have been found in East Japan and it is rare to find one in West Japan. The purpose of the Dogū remains unclear but, most likely, the Dogū acted as effigies of people, that manifested some kind of sympathetic magic. For example, it may have been believed that illnesses could be transferred into the Dogū, then destroyed, clearing the illness, or any other misfortune.